The Seoul’s Global Digital landmark will soon be completed. 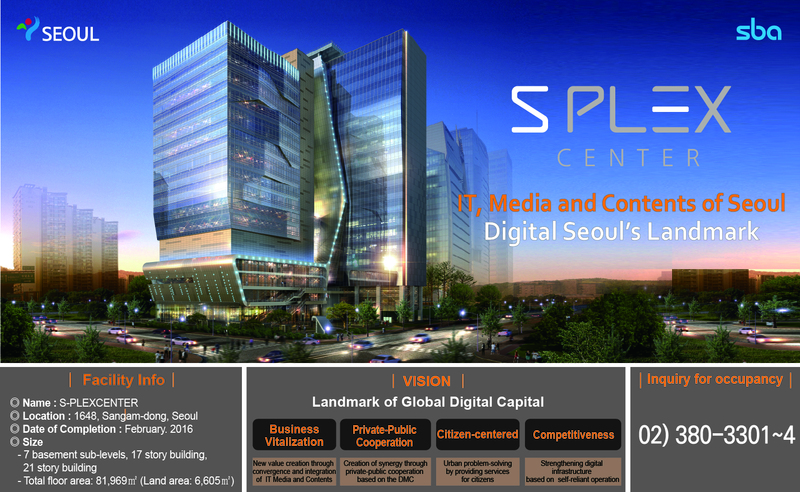 The construction of S-PLEXCENTER, a multicomplex for IT, digital media and cultural content, is scheduled to be completed in Digital Media City, Sangam-dong, Seoul by February 2016. S-PLEXCENTER consists of two buildings, S1 and S2: S1 (Synergium) will feature the nation’s largest e-Sports stadium, while S2 (Smartium) will include an IT, Seoul Cyber Security Center, Seoul Cloud Center and Seoul Traffic Broadcasting System. The Seoul Metropolitan Government and SBA (Seoul Business Agency) announced the beginning of tenant bidding at the end of December, 2015.